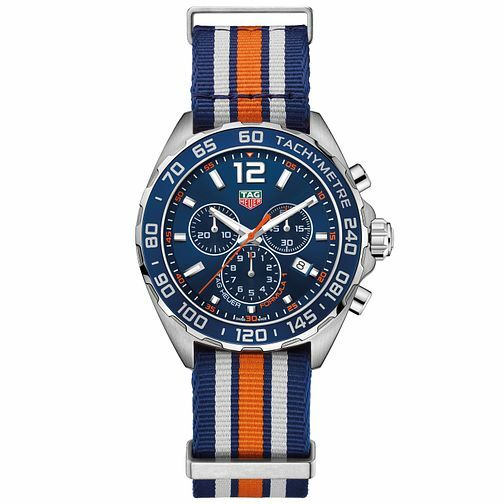 From TAG Heuer's technologically advanced Formula 1 collection, comes this enticing stainless steel strap watch with chronograph, three sub dials, blue dial and date window, along with a blue tachymeter bezel. A bold, sporty timepiece, designed to deliver supreme reliability, inspired by the Mclaren Formula 1 team. TAG Heuer Men's Formula 1 Stainless Steel Stripe Strap Watch is rated 5.0 out of 5 by 1. Rated 5 out of 5 by Anonymous from Hard to fault This is a great looking watch to wear with a t-shirt and stands out as different from other watches on the market with its blue and orange striking design. As a functional watch it’s bang on too, first class timekeeping (fast by only a couple of seconds over five months) a well made chunky feel. Comfortable strap too.